Index welcomes King Hamad of Bahrain’s pardoning of human rights defender Nabeel Rajab, who was in the third month of a six-month sentence connected to his expressing an opinion in a tweet. 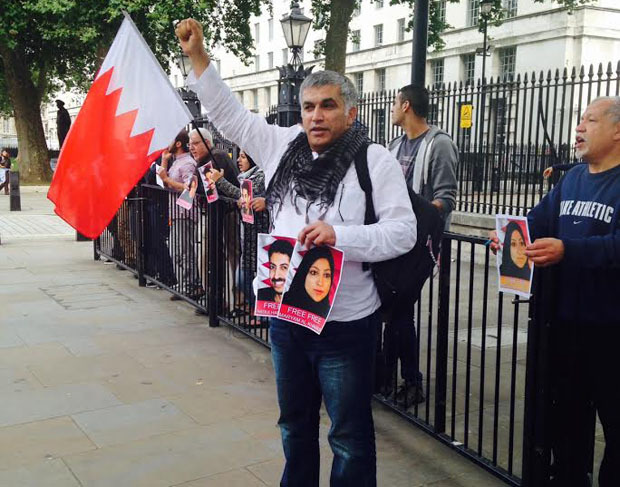 According to Bahrain’s official news agency, Rajab was pardoned over fears for his health. However, the country must do more to respect the freedom of expression of its citizens by dropping all charges against political prisoners whose so-called crimes have been to campaign for greater democratic rights, or expressing opinions. “This action by the king undoes a grave miscarriage of justice. But Rajab is just one of the campaigners that have been targeted with judicial harassment by the Bahraini government. Index calls on King Hamad to pardon all the political prisoners currently serving sentences on spurious charges,” Index on Censorship CEO Jodie Ginsberg said. Rajab is among the Gulf region’s most well-known human rights activists. He is the president of the Index award-winning Bahrain Center for Human Rights (BCHR), and a member of the advisory committee of the Human Rights Watch Middle East division. Since the Bahraini uprising of 2011, he has been arrested on numerous occasions and had his house tear-gassed for leading protests in which he and others voiced criticism of the Bahraini government. Having been imprisoned between August 2012 and May 2014, Rajab was once again arrested in October 2014 and charged with “insulting a public institution”. His crime related to tweets in which he alleged that some Bahraini soldiers may have defected to the Islamic State, referring to Bahraini institutions as “ideological incubators”. In May, his six-month prison sentence was upheld.